Loop is Frontiers’ next generation social network for researchers, academics and scholars. We are the only open network that integrates into journals and academic websites. To start, we are integrated into both the Nature Publishing Group and Frontiers’ journal series. Loop’s cross platform integration makes you and your research discoverable across the boundaries of publishers and organizations. 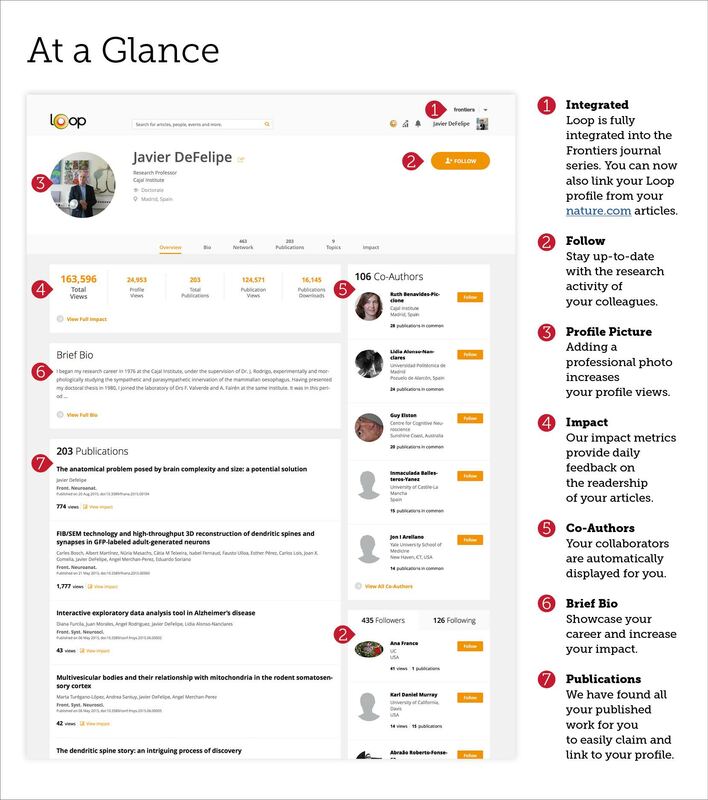 If you have a Loop profile, it will be discoverable via your articles in the original journals in which they were published. Examples of online author profiles can be seen on the following Nature and Frontiers articles. Sounds simple, but it has never been done before. Loop profiles are a showcase of your publications, achievements and impact. On top of that, Loop is built to disseminate your work and maximize the readership of your articles. Multi-source, real-time impact metrics are showcased on your profile and provide you feedback on your readership and impact across institutions, geographies and disciplines. Loop showcases your research, ensuring it reaches the academics that matter and therefore increasing readership for your articles. With the millions of research papers published every year, a lot of time is wasted trying to find the most important articles. Advanced algorithms ensure the most relevant research is aggregated and delivered to you, allowing you to stay on the cutting edge. Our algorithms identify researchers with similar interests, enabling you to connect, collaborate and discuss. Our vision is to build an Open Science platform that empowers researchers in their daily work and where everybody has equal opportunity to seek, share and generate knowledge. Open-access publishing has been one way to achieve this, but Loop takes open-access to the next level: it improves the visibility and discoverability of editors and authors, their achievements and above all, maximizes the readership and dissemination of their articles. This is enhanced further as an open research network that connects original content to a universal academic profile, facilitating easier ways to find and share knowledge. Create your Loop profile and let us maximise your impact.